whose adherents hold our Torah to be Holy Scripture and who worship the same God we do. Secondly, I’m appalled that they would choose to express their disdain by being disrespectful to Christian clergy, spitting at them as they pass them in the streets. Sadly, the phenomenon seems to be on the rise in Jerusalem. In a move that’s a surprisingly refreshing defense of the Christians, a Jerusalem judge recently dismissed a court case against a priest who punched a Jew who spit on him, saying “putting the defendant on trial for a single blow at a man who spat at his face, after suffering the degradation of being spat on for years while walking around in his church robes is a fundamental contravention of the principles of justice and decency.” You can read more about the situation in Haaretz. For a discussion on why some Orthodox Jews engage in this despicable behavior, see Failed Messiah. City Council, organized a visit to the Greek Patriarch, head of the Greek Orthodox church in this part of the world, to express our regret for these problems. Dr. Margalit said he was organizing the visit in the name of “Am Yehudi,” the Jewish People. I was honored to be included as part of the delegation, which also included Jerusalem Deputy Mayor Pepe Alalu, also of Meretz, and a third Meretz City Councilperson, Laura Wharton. 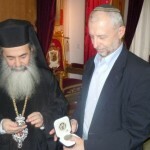 Also in the delegation were another representative of Rabbis for Human Rights, Rabbi Arik Ascherman, and a few other individuals, most of whom were associated with Meretz. The Patriarch (his official title is “His Most Godly Beatitude, the Patriarch of the Holy City of Jerusalem and all Israel, Syria, Arabia, beyond the Jordan River, Cana of Galilee, and Holy Zion, Theophilus III”) is the spiritual leader for about 150,000 Greek Orthodox Christians living in this part of the world. He greeted us with a round of glasses of schnapps and the traditional Hebrew toast, “L’chaim! (to life!). Dr. Margalit opened the discussion, expressing his regret for the behavior of the spitters. The Patriarch was very gracious in his response, saying unfortunately all groups have some people like that, and as a Christian he forgives them, as Jesus taught if someone hits you on one cheek, offer them the other one. I shared my religious perspective, which was to appreciate the Patriarch’s understanding and forgiveness; however, I am deeply embarrassed, as a rabbi and a religious Jew, that people who dress in a way that identifies them as “religious” would act so disrespectfully. This goes completely against the teachings of the Jewish tradition that kavod habriot, human dignity, is a central value to us, that applies to everyone, not just Jews, as we are all created in the image of God. The behavior of the spitters is a hillul Hashem, a desecration of God’s name, which is a grave sin as it makes God and religion look bad in the eyes of the people. This launched an interesting theological discussion between myself and the Patriarch (who speaks excellent English) which touched on forgiveness, the variety of paths to reaching God, etc., including quotes from the Hebrew Bible (aka “Old Testament”), the New Testament, the Talmud, the 19th century Rabbi Moses Mendelssohn, and the 2nd century Saint Justin. Pepe Alalu also shared a few words of sympathy; taking advantage of having three members of the Jerusalem City Council present, the Patriarch also expressed his concern that the Old City should remain a holy place; there has been talk that there is not enough “nightlife” in the Old City, and some people want to set up bars and nightclubs. Not surprisingly, the Patriarch feels this is not appropriate in such a holy place, there are plenty of other locations for such diversions. The Patriarch also spoke about the power of Jerusalem for pilgrims; people who are distant from religion and God come on a visit and find their faith energized by this special place. All in all it was an interesting visit; it’s sad that the stimulation was, once again, unfortunate acts by some intolerant Jews, but it was a relief to me that the Patriarch was understanding and did not take greater offense. I don’t know if I would be as understanding if I were spit at in a similar way.